Passaic River, Rutherford, NJ - The Rockland youth rowers captured one bronze and four silver medals on Sunday facing local competition at the Head of the Passaic, a 2.7 mile head race. The event is co-hosted by the Passaic River Rowing Association and the Nereid Boat Club. "The regatta provided an opportunity for our team to show its depth as we had favorable results across the board," said head coach Melissa Boyd. "It is always great to see hard work pay off for our athletes." The morning started with the boy's varsity quadruple sculls finishing second-place with a time of 14:56.34 behind Ridgwood (14:12.25) and ahead of Nereid (14:59.25). The silver medal continues a successful season for the boat comprising rowers: Anthony Rostek Tappan Zee '20 (stroke), Anthony Feteira Clarkstown South '19 (three), Billy Grippi Tappan Zee '20 (two), and Ryan Almond Clarkstown North '20 (bow). 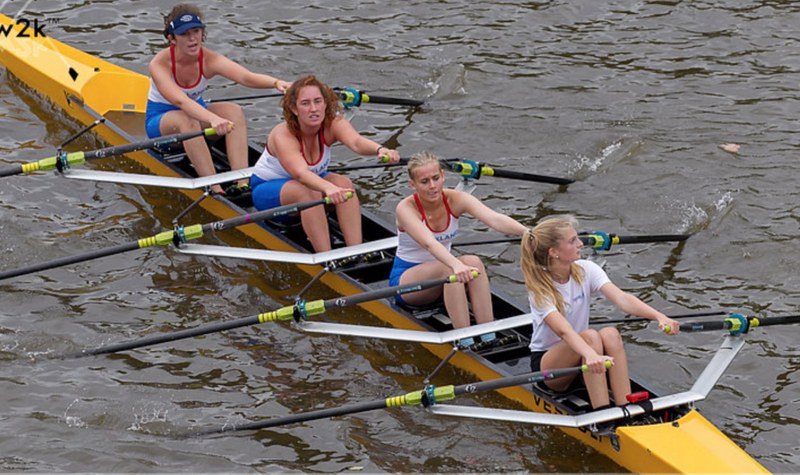 Competing in the girl's varsity single sculls, Gabriele Welp IHA '19 recorded a time of 18:31.50 to finish in second-place, six seconds back of the winner from Nereid. Welp started second to last in the time trial race and had to work her way through several competitors while Nereid started first and extended its advantage over the other boats by steering through its home course well. In the afternoon Welp (bow) earned her second medal of the day competing in the varsity double sculls race and was joined by teammate Chloe Young Ridgewood '18 (stroke). Young had also previously raced in the day, but the duo still showed good speed with a third-place finish for the bronze medal in a competitive 11-boat field. They clocked a time of 19:57.64, seven seconds behind Ridgewood and 23 seconds behind City Island. Rockland wrapped up its day with a strong showing by the novices. Rostek (stroke) and Grippi (two) earned their second silver medal of the day in the boy's novice four and were joined by Wilhelm McGinnis Nyack '19 (three), Cory Gorczycki Hackley '19 (bow) and coxswain Emilie Mazzola Briarcliff '18. The crew finished in a time of 22:25.15 behind winner Kearney (21:14.87) and ahead of Mountain Lakes (22:59.22). The girls finished second-place in the novice quadruple sculls with Olivia De Maria Northern Highlands '20 (stroke), Leyla Arcasoy IHA '20 (three), Kate Bushell Pascack Hills '18 (two) and Lucinda Carroll Nyack '19 (bow) with a time of 24:09.14, 25 seconds ahead of the next best competitor. The team also finished in the top half of the girl's junior varsity double sculls with Lucy Jackson Nyack '18 (stroke) and Michaela Davidson Clarkstown North '19 (bow). A select crew will next race at the Head of the Charles in Boston, Mass. on Sunday, October 22.